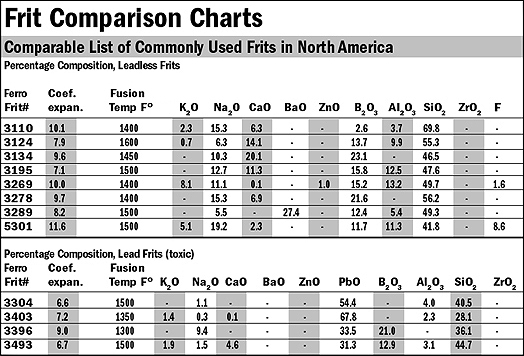 Frits are manufactured (melted and fused in a furnace, quenched and ground to a powder) precision stable mixtures of inorganic substances. Basically, they are complex combinations of oxides normally including silica (glass). With the addition of 10% clay, most are clear low-fire glazes by themselves. They offer stability and relative safety in their powdered form by rendering solubles and hazardous components insoluble by combining them with silica. Formulated and manufactured to exacting specifications, they are an exception to the usual impure vagaries of most ceramic raw materials.